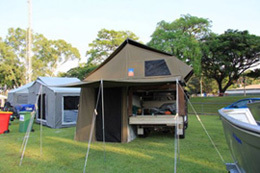 We design and manufacture canvas tents for the caravan industry. We carry a full line of parts, plans for wind-up campers. Please let us know if we can make something specifically for your requirements. Custom canvas work is our specialty. Canvas designs produce high quality canvas goods to the industry, using Wax Converters Textiles Australian made cloths.